The Inca are definitely not gone. But the most striking testament to the grandeur of their civilization lays in literal ruins, thanks to the Spanish. Try as they might, they could not erase everything. For every temple that was turned into the foundation of a Catholic church, for every citadel that was pilfered for building blocks, and for every palace that is now the wall of a Starbucks or a luxury hotel, there are places like Moray, Chinchero, and Maras, spectacular Inca sites located in the Sacred Valley. Chinchero is one such temple turned church. We visited this small village on a Sunday morning, where mass was being said in Quechua. The Spanish liked to co-opt Inca holy places as their own – to literally project the Christian faith over the Inca state religion as a tool of conversion. What remains here is a plaza in front of the church distinguished by its trapezoidal nooks, distinctive of Inca sacred architectures. These spaces would likely have been filled with mummified ancestors or offerings on any number of special festival days that make up the Inca religious calendar, which marked the planting season, the harvest, the equinox, and the solstice, for example. Today, a local woman is drying her potato harvest in the sun on the immense terraces are also integral parts of Inca temples. Her crop, once smashed and dried in the sun, will be edible for several years down the line, if she stores it properly. The Inca used to keep stores of these dried potatoes in granaries along their imperial roads, as fodder for troops on the move and as a hedge against the sort of unpredictable harvests brought by el Nino. This Sunday, this local woman, like her ancestors for dozens of generations, is hedging her own bets in much the same way, on this no longer sacred terrace, in front of the church which now talks about abstract concepts like salvation and redemption. Just down the road, Maras is a working salt mine, in continuous production since well before the rise of the Inca. 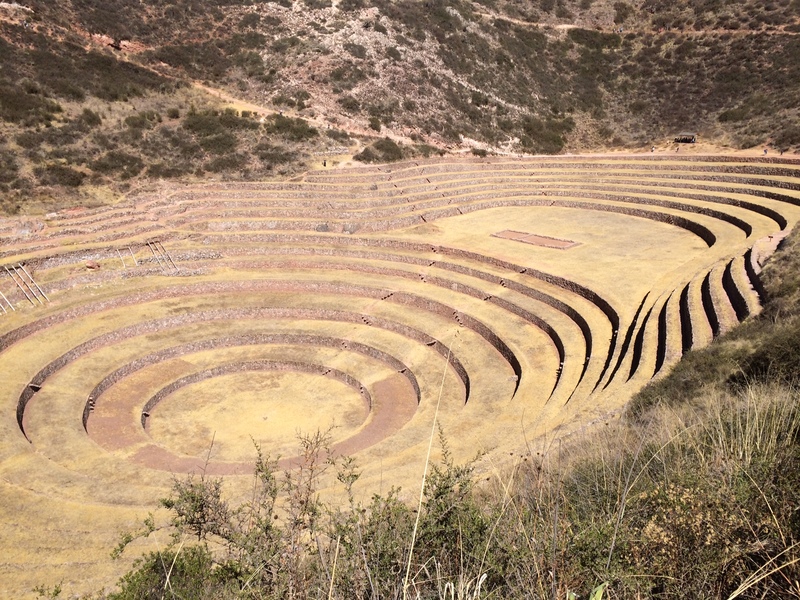 A natural spring gushes warm salt water into terraced pools, which workers tend using ancient techniques that modern science would call “evaporation.” A ruined stone structure which, half a millennium ago, housed their Inca predecessors stands on the rise overhead. 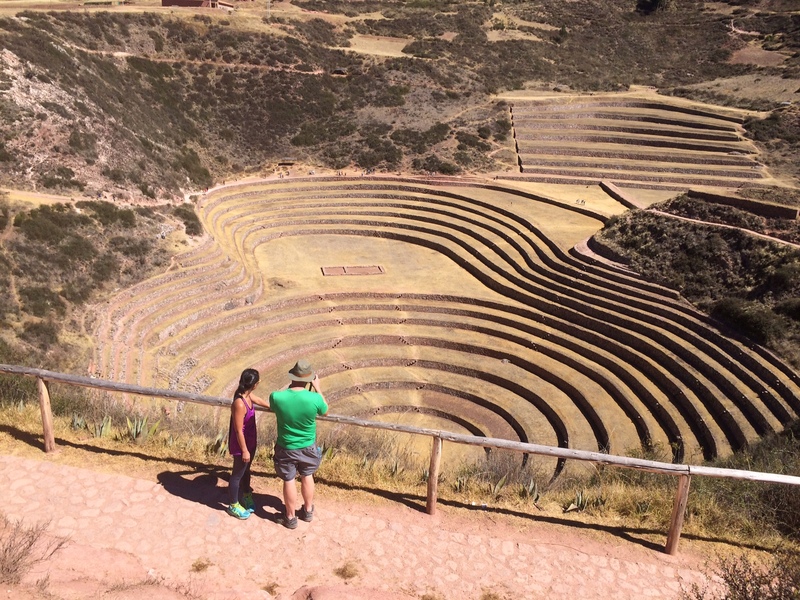 Finally, we reach Moray, an arresting rounded terrace that archeologists believe represented an Inca attempt at experimental agriculture. Most Inca terraces follow the contours of the land, and this one is no different, hugging the insides of a natural depression in the valley. Priests, astronomers, and agronomists (in the times of the Inca, this may even have been one person!) would have tended the crop here, experimenting with elevations along the terrace, harvest dates, and other variables to produce the best yield. Make no mistake, the Inca could be ruthless conquerors. They maintained an empire, exercising dominion over millions of people from the rainforests of Ecuador to the antiplano of Bolivia and Chile. But they weren’t savages or ignorant, and unlike the Spanish, they were very interested in learning from the techniques and traditions of those they ruled. Treading lightly on the earth, learning what you can from the ways of others. Without a formal system of writing – keeping records and doing math with a system of knotted string – they were able to produce some true wonders of the world.